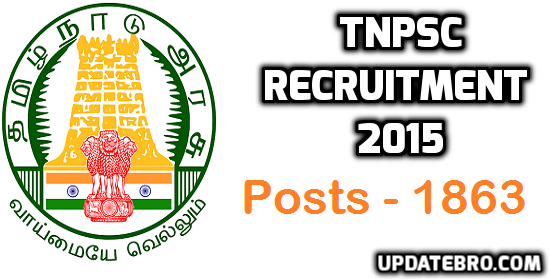 TNPSC Group 2 Recruitment Notification 2015 : TNPSC CCSE 2 (Group 2) Notification has been released by Tamil Nadu Public Service Commission (TNPSC) on 12th October 2015. This is a wonderful opportunity for those who are passionate to working on Government Sector. TNPSC Group 2 1863 Posts are available in various departments like Tamil Nadu Secretariat Service, Ministerial Service, Divisions of Commercial Taxes Department. The interested candidates can apply for this TNPSC Group 2 Jobs on or before 11-11-2015. You can check out the other important details like TNPSC Group 2 Recruitment eligibility criteria, age limit, last date, apply online and more. As soon as possible we will update the TNPSC Group 2 Syllabus, Model Question Papers. TSPSC Recruitment 2015 Notification – 563 Asst Engineer Posts Apply Online. BEGC Recruitment 2015 Notification of 690 Posts – Apply Online. No maximum age limit for SC, SC (A), ST, MBC/ DC, BC, BCM and Destitute Widows of all Castes. Educational Qualification for the posts of TNPSC Group 2 2015 is respect to the post. Personal Clerk : Applicant must hold Bachelors Degree & he must have passed the Type Writing test conducted by Government. Assistant : Applicant must hold Any Degree from Madras University. Assistant in Finance Department : Applicant must possess Bachelors Degree in the streams of Commerce / Economics / Statistics from any University. Planning Assistant & Legislative Assembly : Applicant must hold the B.A or B.Com or B.Sc from any University. Junior Co-operative Auditor : Candidates Should Posses B.B.M or B.Com or B.A or B.B.E from a recognized university. RRC Recruitment 2015 Notification – Sports Quota 52 Posts.